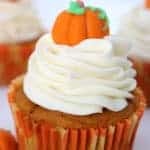 Today, I am sharing this recipe for Easy Pumpkin Cupcakes with Cream Cheese Frosting. No need to make them from scratch when you can use a simple cake mix. Great for fall and Thanksgiving dessert. In a large bowl, combine cake mix, cake mix ingredient, pumpkin and pumpkin pie spice. Fill each liner 2/3 full of batter.